The pretty fishing village of Appledore is located at the mouth of the River Torridge in Devon. It is a beautiful place to stay in one of the numerous holiday cottages either in Appledore or nearby. Appledore is a much-photographed little village due to the pretty pastel-coloured fishing cottages that line it’s winding streets. As well as traditional seaside holiday activities such as sampling a Devonshire ice-cream, going crabbing, fishing or perhaps visiting one of the surf beaches nearby, Appledore offers so much more. There are many art galleries and shops in Appledore, many showcasing local talent. Appledore is a fantastic place to visit in the summer when one of it’s many festivals takes place. Appledore is home to the biennial Appledore Arts Festival which offers workshops, displays and art projects, whilst there is also an annual Appledore carnival which has taken place every year since 1903. For book lovers, while staying in a cottage in Appledore, try and time your stay with the Appledore Book Festival which offers a great programme of events for both adults and children. The little seaside village of Appledore, located in scenic North Devon, is thick with character and maritime history. It was a centre of English shipbuilding for almost two hundred years, and was also the haunt of smugglers. Today its streets are alive with shops, pubs and even art galleries, which have augmented rather than compromised its Elizabethan charm. Its solitary surroundings and the beauty of the countryside, as well as its thriving cultural scene, have made Appledore a popular destination with holiday-goers looking for self catering accomodation. It’s hard to talk about Appledore with constantly referencing the sea. The entire village is drenched in a kind of salt-water charm, and the old pubs that line its streets are evocative of a time when sailors and smugglers sat pulling at their pints and sharing stories of nautical adventures. Shipbuilding is still one of Appledore’s chief industries, and the spiritual heart of the village is the Appledore Quay, where visitors and locals alike can take their families for an afternoon of fishing or crabbing. Those interested can book a boat trip from the Quay Cabin, and set off to fish for sea bass or mackerel, or just spend a leisurely few hours relaxing beneath the open sky, rocked by the swell of the sea. Appledore is located at the mouth of the River Torridge, right where it enters the broad Torridge Estuary. There are beautiful beaches to be explored here, and lucky holiday-goers might get the chance to snag themselves a cottage with sea views, which they can use as a base for trips around the estuary. The sea here is perfect for bathing, as sandbars impede the force of the tide and the waves, making for very calm water. Children will enjoy making sand castles and playing on the beach, while adults can lounge in the sun, reading or just watching the ebb and flow of the tide, sun sparkling on the water. Those who prefer a more lively day out can head into the village itself and experience first-hand the charm of its small but bustling centre. There are shops filled with arts and crafts and marine chandlery, among a diversity of other odds and ends, and there are cafes and restaurants for when you’re feeling a bit peckish and are tired of walking around. If you head to Docton Court Gallery on any Monday or Wednesday at 4:30 during the summer, you can join a guided walk of the village, led by local historian David Carter, author of “Illustrated History of Appledore”. At the end of the day you can stop by one of the local pubs for some good, hearty food, and if you’re lucky, some live music. Appledore contains a handful of sites of historical interest, including the Appledore Lifeboat Station. The crew of this station have been saving lives along the North Devon coast for almost two hundred years, and have won many awards for their bravery and selflessness. Although they are trained to a very high standard, the men and women who crew the station are volunteers, and they run their rescue service entirely on donations. After visiting the Lifeboat Station, you can head to the North Devon Maritime Museum. There are several different exhibits to see, including displays dedicated to shipbuilding, sail and steam vessels and shipwrecks. The museum is open from April to November. An exciting day out can be had by visiting the Skern Lodge Outdoor Adventure Centre. The team at the Skern Lodge can put together a thrilling itinerary for the entire family, tailoring a day of adventure to your needs and desires. You can choose from activities such as archery, climbing, high ropes and offroad cycling, or head out for an educational walk along the coast. If getting out on the open sea is what you’re looking for, you can opt for kayaking, powerboating, surfboarding, body boarding and even surf skiing. If you want a more relaxing day at the lodge, you can hang out by the pool while the kids play games or embark on a scavenger hunt, and then wrap up the evening by telling stories and roasting marshmellows over a campfire. Adults who want to do their own thing while someone else takes care of the kids can take advantage of the summer camps offered by Skern Lodge, which last for a week or just a weekend. One of the great things about renting a holiday cottage in Appledore is the village’s proximity to many of North Devon’s most exciting natural attractions. Appledore is within walking distance of the famous Tarka Trail, which meanders for one hundred and eighty miles through the gorgeous landscapes of the county, featuring heart-stopping views of coastal cliffs and the sea, sandy bays and idyllic wooded valleys. Part of the trail is open to cyclists, and if you’re lucky enough to have a rental property in Appledore you will have the option to walk the closest part of the trail, or set off on a week-long adventure to experience it from beginning to end. Appledore is actually located within the North Devon Biosphere Reserve, which is one of only six sites in the UK designated as areas of outstanding natural beauty by UNESCO’s Man and the Biosphere Programme. The reserve includes the Torridge Estuary and the catchment areas of the Taw and Torridge rivers, as well as the remarkable Braunton Burrows sand dune system, which has been designated a Special Area of Conservation and a Site of Special Scientific Interest. Whether you enjoy bird-watching, hiking or outdoor sports, Appledore is perfectly located to take advantage of these and a wealth of other activites you can enjoy within the North Devon Biosphere Reserve. The North Devon Biosphere Reserve extends out to sea, in order to include Lundy Island, which is a gem of unspoiled beauty and an icon of peace and tranquility in North Devon. This gorgeous, emerald-green island is never crowded, and is the perfect place to head when you want to get away from it all. You can catch a boat to Lundy Island from Appledore on most days of the week, whether you’re looking for a day trip or an entire week away from civilisation. After a few hours walking along the sandy beaches or granite cliffs of Lundy, or losing yourself in its emerald hills, you will feel as though you’ve wandered into another world, one far away from every worry or care. The island also offers excellent fishing and diving off its coast, and if these activites are what interest you, you can book a trip from Lundy Charters in Appledore. Although it’s an hour’s drive from Exeter, the largest town in Devon, Appledore is conveniently close to the quaint villages of Instow and Barnstaple. Many people look for cottages to rent in Appledore when they want some time to explore the entire region, including these charming destinations. Barnstaple features the Museum of Barnstaple & North Devon, which is dedicated to the history and culture of North Devon, from the earliest human settlements up to modern times. You can also find the stately Queen’s Theatre here, which hosts shows and festivals throughout the year. 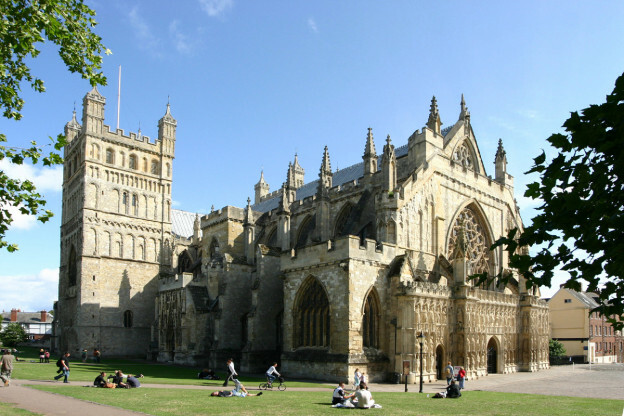 Those who want to explore the town will find impressive sites such as the ruins of Barnstaple Castle, the ancient Saint Anne’s Chapel and the Victorian Pannier Market. Instow, located across the estuary from Appledore, is chiefly notable for the beautiful Instow Beach, where windsurfing and kite surfing are popular. The beach is backed by the impressive sand dunes of the North Devon Biosphere Reserve. When visiting Appledore, a great idea is to time your self catering holiday for one or more of the excellent local festivals. The Appledore Summer Festival takes places at the end of July, and is a great time to experience the best of local music and cuisine. The festival features events for the entire family such as arts and crafts and dance sessions, and is a splendid celebration of the summer season. Those who visit Appledore at this time will be spoiled for choice, because the Appledore and Instow Regatta also begins at the end of July. When August rolls around the annual Appledore Carnival and the Appledore Food and Craft Market attract many visitors, and in September the village hosts the Appledore Book Festival, which features workshops by important UK authors. Appledore is a gem in the crown of North Devon’s beautiful coast, and it’s no suprise that more and more people are looking into cottages for rent in this peaceful seaside village. Only those lucky enough to rent or own a holiday cottage in this corner of the country will understand the bliss of life under the mild summer sun of North Devon, and will experience the wealth of attractions this charming village has to offer. If you’re searching for the perfect holiday destination for you and your family, consider looking for uk cottages in Appledore. It will be difficult to find a more idyllic location in the country.